Mom, do we have any leftover refreshing? Which wine goes with coordinated refreshing? Photo courtesy of Lisa Liotta. Message printed on side of an enameled pan. This message must have been wrotten by a politician. I thought farting, was a better way of covering up cooking smells. I see. Under the progressives it is no longer Red China. It is now Lavender China. The line after “streaming” must have been composed by an ex-spurt. My coordination has gone to pot. 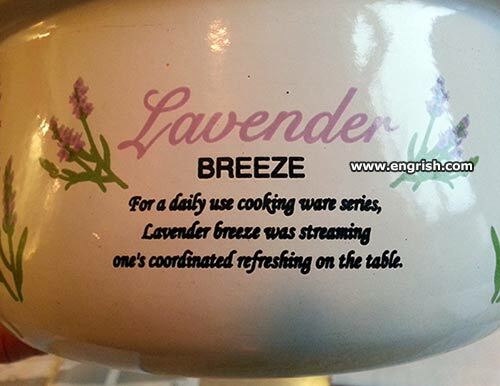 Cooking with lavender breeze is likely to give you wind. The lavender odor is to cover up that you burned the pot roast. Netflix comes with lavender flavor. Great improvement.